This has to be one of the most useful recipes on my blog. 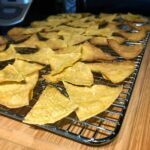 I’ve been mentioning these low calorie tortilla chips for what seems like years, but I’ve held off on putting them in official blog post form because they’re so simple. It seems a bit extra of me but whatevs, it just makes pointing to them so much easier. 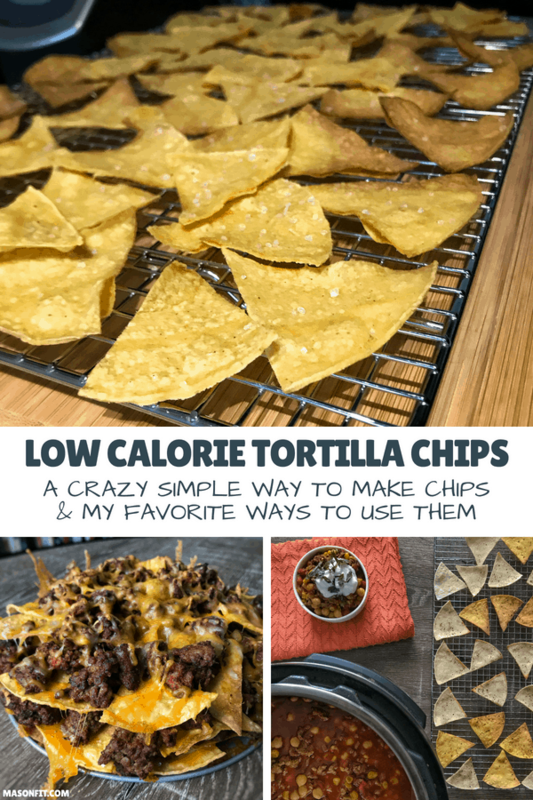 These low calorie tortilla chips are super simple to make and only use 3 ingredients. Well, really just one ingredient if you want plain chips. Either way, if you’re a visual learner you’ll enjoy the video below. Simple, right? You could make these chips a number of ways in terms of seasoning. I’m typically using them with Mexican or Tex-Mex inspired dishes so I like the lime and sea salt version best. The recipe calls for tortillas made by Mission. I buy them at Walmart and Kroger, but other readers have found them in local grocery stores as well. If you have trouble finding them, any thin corn tortilla will do. For macro comparison, three of the Mission extra thin tortillas have 120 calories, 24 grams of carbs, 3 grams of protein, and 1.5 grams of fat. All right, let’s get to dippin’. How to turn plain old corn tortillas into delicious low calorie tortilla chips. Line a baking sheet with parchment paper or nonstick cooking spray. Sprinkle salt and lime juice on top. Bake for 6-8 minutes or until golden brown/crispy. To make these low calorie tortilla chips in the microwave, cut the tortillas into triangles all the same. Spread them out (you'll only be able to fit 2-3 tortillas worth of chips at a time) on a piece of parchment paper and microwave for 2-2.5 minutes. Keep an eye on them and be sure not to burn them. Remember, they'll crisp up a bit more after removing them from the microwave. When you try these low calorie tortilla chips and the recipes I mentioned to pair with them, I wanna hear about it. Take a picture of your creations and tag me on Instagram and I’ll be sure to share it with the world! And one more thing before you go. I have a free cookbook that you might like. It has nearly 30 of my most popular high protein chocolate recipes inside. If you’d like a copy, just enter your email in the form below and you’ll get on straight in your inbox. I’ll also send you an email every week or two with a roundup of all the new recipes I’ve published on this blog, my second food blog, Mugs for Muscles, and as Stronger U’s Chief Deliciousness Officer. I came across these when I was making the healthy nachos and i’ve made the chips by themselves at least 6 times. The lime/sea salt combo is so good! I pair these chips with the greek yogurt guac from trader joes and it’s the perfect low cal low fat snack. I did these in the microwave and it worked great! Just keep a close eye on it!!! I’ve burned them more than once…. LOL!! I’ve used the Joseph’s Lavish wraps to make strips for soup and salads too! 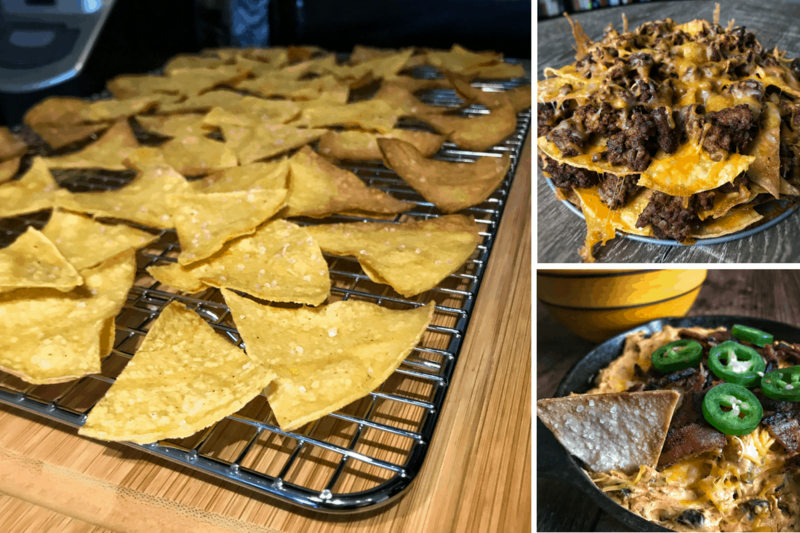 These are so good, they’ve become a staple for me any taco night and make for some great nachos. I’ve found that they store pretty well too and stay crispy so sometimes I make a big batch to have on hand if I’m craving something salty. I’ve also found that playing around with seasonings can make for a nice twist. For example sometimes I season mine with paprika or chili powder for a little kick. I made these using the Joseph Lavish wraps. Such a healthier alternative to buying tortilla chips. I just sprayed them with PAM and sprinkled with salt. Just make sure to watch them carefully in the oven. They can burn very easily…. I also did this and sprinkled them with stevia and cinnamon for a sweeter chip! Definitely recommend! I will not lie. You see my lack of control either with chips at a Mexican restaurant, or when I make these. I had no idea this was possible so when I tried it, and it worked, I was thrilled. These are cheap and easy to make. You can get a large pack of tortillas for just a couple of dollars at the store. I have yet to master storing them so I can use them for meal prep, but nonetheless they are perfect for game day or any other event. Or just for me. Because well. I love chips. Constantly making these in my house for a healthier Taco Tuesday! How long do these last after baking? How fast can you eat? Kidding. They tend to soften a bit after baking. So I wouldn’t recommend making a ton in bulk.